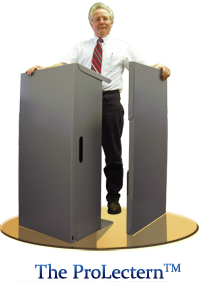 Portable Podiums look especially professional in lecture halls. The podium gives professors an excellent base for their materials. It is a place to hold notes and outlines while lecturing. It is easy to set up and tear down, so it can be moved if the next professor to hold the lecture hall chooses not to use it. The Portable Podium is an excellent addition to any awards ceremony. It looks professional and dresses up any event it is brought to. It can be leveled out on top in order to hold a projector if a slide show or video is desired at the ceremony. It can have wires run through it, which hides the wires from sight, making the stage look less cluttered and awkward. Its light weight, and easily managed design make it easy to set up before the ceremony and tear down afterward. It can even be stored behind a door or in the trunk of a car between ceremonies. The Tabletop Podium is especially useful to the students living in the residence halls. It is great on movie nights. The students can set a laptop, small television, or projector on the Tabletop Podium to put the screen at prime viewing angle. Another great way to use the podium is as a lap desk. It makes a great hard surface, and when folded down is small enough and light enough to hold on a student’s lap so he or she can move away from his or her desk to do homework. It can also be set up on the floor and used like a table for projects. These Podiums can even be used to dress up a hall meeting. These lecterns can also be folded down to fit behind a door or slide easily into the back of a closet, so they don’t take up much of the limited amount of space in the residence halls. Gone are the days of awkwardly standing in front of a classroom attempting to give a presentation while feeling totally exposed. The Portable Podium and Tabletop Podium are great for class presentations. Students can carry them in by themselves and set them up. It takes the presentation up a level in professionalism. It also gives the student a base for notes and something to stand behind instead of standing awkwardly holding a handful of note cards. The Portable Podium can be stored in a residence hall room while it’s not being used, so it doesn’t even have to be left in the classroom and can be personalized to the student to make it more fun for the student. Everyone can find a use for a Portable Podium or Tabletop Podium on a College campus. Students and Professors alike will find these lecterns useful in their everyday lives with their wide variety of uses. 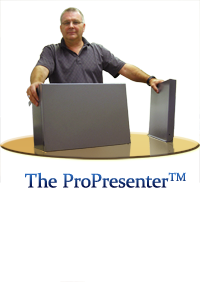 The ProLectern™ - Our portable lectern. A better paradigm for public speakers. It's all one piece, solid when deployed, and completely foldable. Convenient and trusty, the patent-pending ProLectern™ fits in the trunk of your car or behind the office door. Weatherized for outdoor use. Equipped with cup holders, a cabinet, wire media ports, and carry handles. The ProPresenter™ - Our tabletop podium. The convenient speaker's tabletop podium fits in your briefcase or beside your desk. It's all one piece and completely foldable. Nearly instant setup and folding provides a smooth transition into impromptu speeches. Face your audience directly and keep your notes conveniently at hand to convey a professional experience! Carry your ProLectern™ with or without a carry bag! Our lightweight carrying bags are a good fit for almost anyone to be a mobile speaker! Both lightweight and sturdy, you have the liberty to mobilize quickly into normal, everyday travel. Total carry weight is around 25lbs. 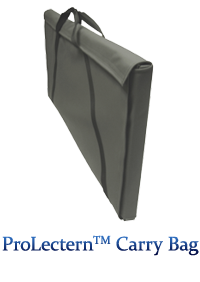 The ProLectern™ Carry Bag is around 2 lbs. Can be folded, easly stored, etc. Receive a streamlined public speaking kit. You will never leave home without it! Custom build your own kit or contact sales for a quick consultation. We deeply value your input as to what sorts of features you would appreciate in your ProProps™. If you have a suggestion for our engineering team, please contact us at feedback@portablepodium.com.